You all know I love NFL Quarterback statistics. You might not know that I keep a “QB Meter” spreadsheet which I update every week. It started after Peyton Manning made the jump to Denver and the Indianapolis Star website stopped carrying their “Manning Meter” which tracked everything Manning, ranked him on the all-time stats lists and projected when he would break records in major categories. As a Colts fan, I decided I needed a Manning meter of my own. Then I branched out and made a meter that compared Manning and Andrew Luck at the same point in their careers. I also made a meter of Colts QBs. Finally, I made a big, sortable list of QBs which contained active starters of 20+ games and top 10 historic QBs in most major passing categories. I update it after every week (with my thanks as always to pro-football-reference) and take a look to see if there is anything notable. Hence, Notes from the QB Meter. 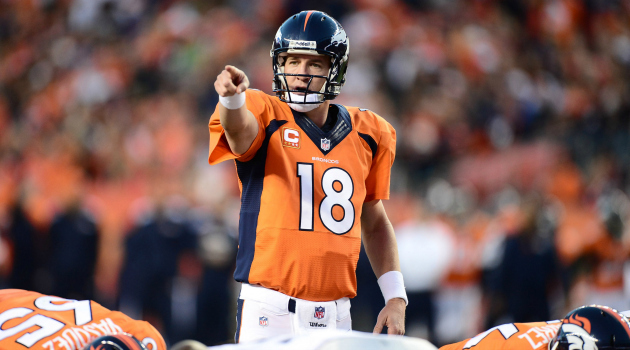 Peyton Manning is on pace to break the single-season records for touchdown passes and passing yards this year (2013). Let’s take a look at Peyton Manning’s 2013 stats compared to those of other QBs after 14 games in their own record-setting seasons. I’ll probably post updates to this after each of the next 2 games as Manning inches closer to these achievements. As always with this football statistics stuff, I never claim expertise, I just do it for fun. I’m late on this week’s update, so there isn’t much analysis and there’s still some stuff from last week’s look. 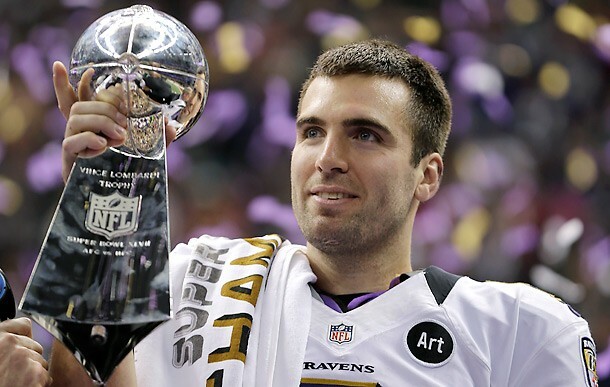 So, Joe Flacco got himself a Super Bowl ring (and a Super Bowl MVP award, despite any arguments in favor of Jacoby Jones). Does that make him an elite quarterback? I expressed some of my thoughts at length earlier and I more or less declared that, prior to the Super Bowl at least, Flacco was not an elite QB. Now that he’s won, I’m prepared to reevaluate and modify my original ideas, if needed. The criteria I laid out in my previous post was meant to be a measurement of who the best active QBs in the NFL are, whether you want to call them “the elite,” as I basically did, or not. “Elite” has been a troublesome word for me as I struggled to write that post, and now this one. The term “elite” is kind of vague. I believe that elite QBs are a smaller group than the “top 10,” perhaps numbering anywhere between 4-8 in a given season. Of course, by saying “in a given season,” I am suggesting that elite status can be temporary. A QB can be really good for 3 years and then wind up playing for another 10 that aren’t so notable. OR, another more likely prospect is that a QB might start slowly and build to elite status. However you try to slice it, the term is kind of hazy. Even if the term isn’t hazy, everyone’s opinion on who fits the term’s definition is different as well. I’ve been trying to write a post about Joe Flacco and whether he qualifies as one of the best quarterbacks in the NFL (let alone, one of the “elite”) for over a week now, with no success. I’ve done all kinds of research, tallying, calculating and clicking around on pro-football-reference.com and wikipedia to find out not just about Flacco, but also about how he compares to most every other long-term starting QB in the NFL since the year 2000. It’s to the point where my thoughts are so disorganized and the information I’ve compiled is so unwieldy that I just need to throw it all (well, not all of it) out there.